Sunday June 2nd 1895 I went to church alone as Will was obliged to fix the tank at the wind pump. We spent the afternoon at home and drove down home a little while after supper. Monday June 3rd 1895 Will worked for me this morning and I did scrubbing and cleaned up my store room up stairs and put the soap away. I ironed in the afternoon and put out a few more tomato plants. I got supper over and went to bed. I have done an awful big days work. Tuesday June 4th 1895 I was busy all the forenoon about the work. Did churning. Will and I went down town in the afternoon was over home and got such nice straw berries. Did my evening work after coming home. 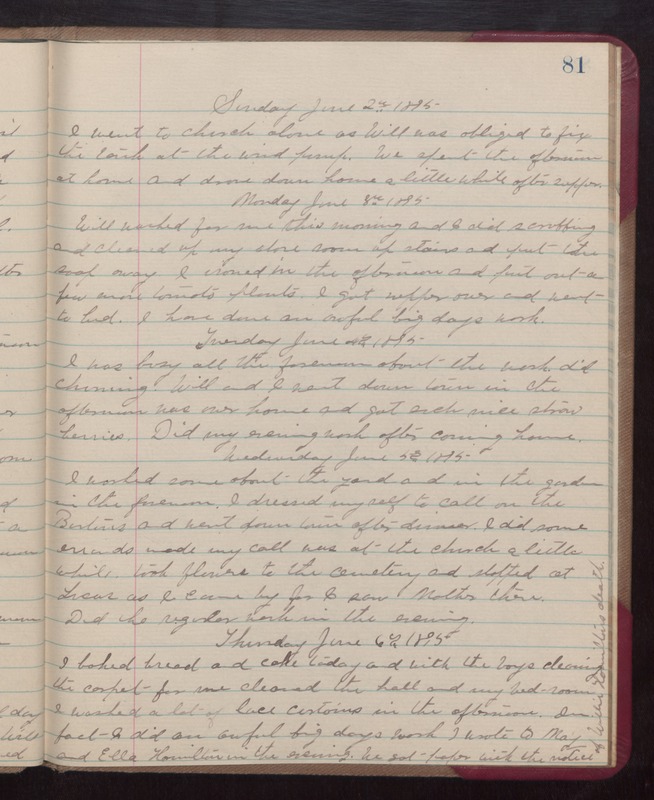 Wednesday June 5th 1895 I worked some about the yard and in the garden in the forenoon. I dressed my self to call on the Burtons and went down town after dinner. I did some errands made my call was at the church a little while. took flowwers to the cemetery and stopped at Lucas as I came by for I saw Mother there. Did the regular work in the evening. Thursday June 6th 1895 I baked bread andf cake today and with the boys cleaning the carpet for me cleaned the hall and my bed-room. I washed a lot of lace curtains in the afternoon. In fact, I did an awful big days work. I wrote to May and Ella Hamilton in the evening. We got paper with the notice of Willie Hamilton's death.